In the Song Properties window, reached via the Song menu's Properties option, you can change mixer and samplerate settings. It also shows file related information. The Sample Rate box specifies the sample rate to be used for audio recording/playback. Usually the default value (44.1 kHz) will be used, as this is the value used on CDs. The bottom entry of the drop down list lets you make the current value the one to be used for new songs. 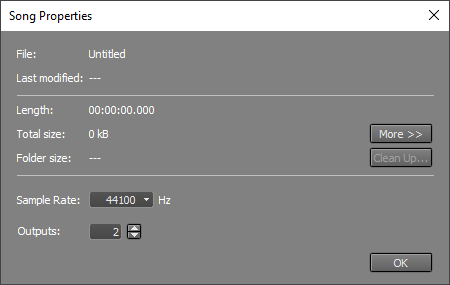 Outputs (Pro edition only) determines the number of audio outputs. This is always an even number, the minimum value is two (stereo), the maximum value is 140. If the value is greater than two all Group and Effect Return sections will have an Output Selector. Note that the Outputs value can exceed the number of outputs the audio device actually has. Any mixer sections using these non-existing outputs will not be heard. The Clean up Song Folder tool analyzes the folder that contains the current song, and lists all MultitrackStudio related files which are not required to play back a song file. You can delete these files in order to preserve disk space. Note: Any alternate or partial takes appearing in a track's file options menu appear in the list, and can be deleted. Once deleted the take will no longer be available. Note: song version files (.hdrversion) and any tracks used by the versions appear in the list as well. If you delete audio files used by a version this version will no longer play back correctly.